SOTHEBY & CO, Fine Indian and Persian miniatures and a manuscript, London 1972. Auction catalogue12th December 1972. Soft cover 24,5 x 18,5 cm. 73 pages with 204 lots, 64 plates. SOTHEBY & CO, Highly important oriental manuscripts and miniatures, London 1970. Auction catalogue 7th December 1970. Soft cover 24,5 x 18,5 cm. 83 pages with 203 lots, 55 plates. SOTHEBY & CO, Indian and Persian miniatures, London 1973. Auction catalogue 27th March 1973. Soft cover 24,5 x 18,5 cm. 45 pages with 272 lots, illustrated. SOTHEBY & CO, Indian miniatures, London 1970. Auction catalogue 20th April 1970. Soft cover 24,5 x 15,5 cm. 36 pages with 233 lots, illustrated. SOTHEBY & CO, Oriental manuscripts and miniatures, London 1967. Auction catalogue 27th June 1967. Soft cover 24,5 x 18,5 cm. 47 pages with 264 lots, 12 plates. SOTHEBY & CO, Oriental manuscripts and miniatures, London 1971. Auction catalogue 7th December 1971. Soft cover 24,5 x 18,5 cm. 63 pages with 326 lots, illustrated. SOTHEBY & CO, Oriental manuscripts and miniatures, London 1972. Auction catalogue 13th December 1972. Soft cover 24,5 x 15,5 cm. 52 pages with 265 lots, illustrated. “Mughal Miniatures of the 16th to 19th century including a Late-16th century Composite Elephant; an Equestrian Portrait of Ahmad Shah; a Miniature of Eight Wise Men, c. 1660 and Company School Pictures; Deccani, Central Indian, Rajasthani, and Pahari Miniatures including three Late-16th century Malwa Ragamala Miniatures; a Mid-17th century? ? Ula Ram” Bhagavata Purana Illustration; a Mewar Rasamanjari Miniature, c. 1615; Persan Miniatures of the 14th to 19th century including Shah "Abbas receiving Khan "Alam in 1618; and Persian Lacquer and Calligraphy; Arabic, Turkish, Burmese and Persian Manuscripts including Assar"s ihr u Mushtari, Shamakha 1456; Sa"di"s Bustan with Miniatures by Mahmud Muzahhib, c. 1540; Nizami"s Khamsa, Shiraz 1547. SOTHEBY & CO, Oriental miniatures manuscripts and an important Qajar painting, London 1975. Auction catalogue 8th April 1975. Soft cover 24,5 x 18,5 cm. 45 pages with 239 lots, illustrated. SOTHEBY & CO, Oriental miniatures and manuscripts, London 1974. Auction catalogue 23d April 1974. Soft cover 24,5 x 18,5 cm. 31 pages with 199 lots, 13 plates. SOTHEBY & CO, Oriental miniatures and manuscripts, London 1970. Auction catalogue 9th December 1970. Soft cover 24,5 x 18,5 cm. 63 pages with 278 lots, 17 plates. SOTHEBY & CO, Important oriental miniatures and a Mughal manuscript, London 1973. Auction catalogue 10th July 1973. Soft cover 24,5 x 18,5 cm. 47 pages with 41 lots, with 43 plates. SOTHEBY & CO, Fine oriental miniatures and manuscripts, London 1974. Auction catalogue 10th december 1974. Soft cover 24,5 x 18,5 cm. 75 pages with 473 lots, 27 plates. SOTHEBY'S, Fine Oriental manuscripts, miniatures and Qajar lacquer. 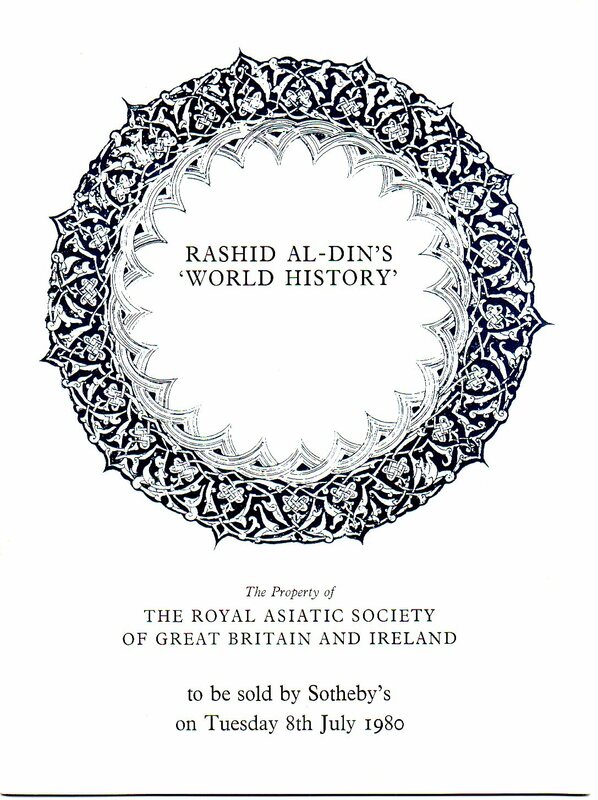 Comprising Rashid Al-Din's World History, London 1980. Auction catalogue 7th/8th July 1980. Soft cover 24,5 x 18,5 cm. 141 pages with 296 lots, illustrated. Plus a separately issued catalogue[same size 28 pages with 13 illustrations of which 8 in colour] on “Rashid Al-Din's World History”. SOTHEBY'S, Fine oriental miniatures manuscripts and Qajar paintings, London 1975. Auction catalogue 9th December 1975. Soft cover 24,5 x 18,5 cm. 91 pages with 457 lots, illustrated. SOTHEBY'S, Fine oriental miniatures and manuscripts, London 1978. Auction catalogue 17th/18th July 1978. Soft cover 24,5 x 18,5 cm. 114 pages with 377 lots, illustrated. SOTHEBY'S, Fine Indian miniatures, Indian and other Asian Works of Art With related material by European Artists, London 1982. Auction catalogue 29th March 1982. Soft cover 24,5 x 18,5 cm. 250 pages with 615 lots, illustrated. SOTHEBY'S, Indian miniatures, London 1977. Auction catalogue 7th December 1977. Soft cover 24,5 x 18,5 cm. 33 pages with 183 lots, illustrated.